If Brad Eldred and the Hiroshima Carp keep playing like this, the six Pacific League clubs aren’t going to enjoy facing them any more than their Central League counterparts have so far this season. Eldred hit two home runs and finished with six RBIs, Ryosuke Kikuchi and Shogo Kimura also homered, and starter Bryan Bullington had a solid outing as the Carp wrapped up the first portion of the CL schedule by routing the Yomiuri Giants 10-3 on Sunday afternoon at Tokyo Dome. 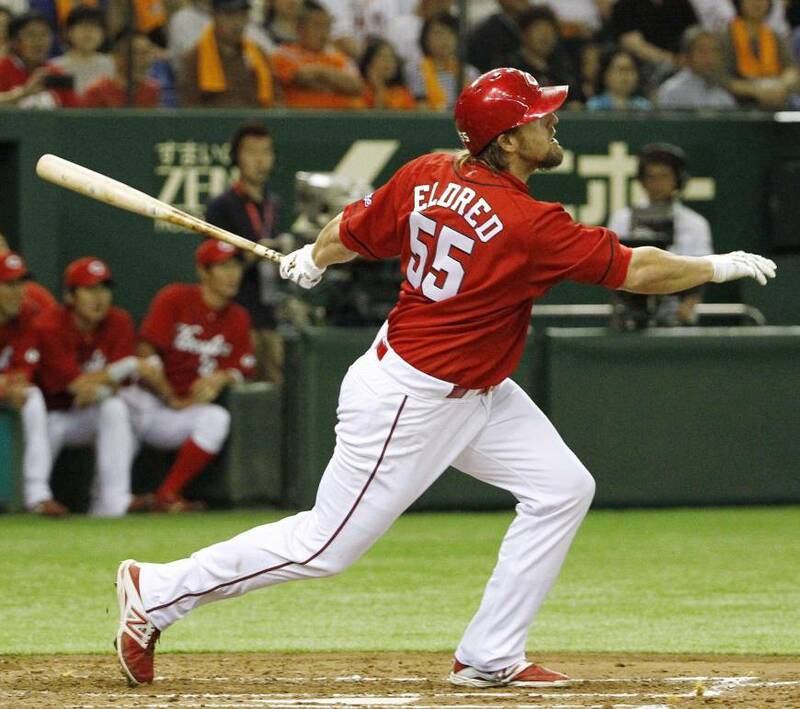 Eldred hit a two-run homer in the third inning and a grand slam in the sixth to pull into a tie with the Tokyo Yakult Swallows’ Wladimir Balentien for the CL lead with 15 home runs. The Hiroshima slugger was 3-for-5 on the afternoon. 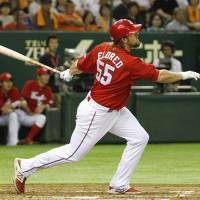 Eldred raised his batting average to .356 and now has 47 RBIs, the most in Japan, in 42 games. He and the rest of the Carp are the PL’s problem now. The CL’s first-place team begins interleague play on Tuesday against the Fukuoka Softbank Hawks and won’t return to CL action until June 27, when they meet the Yokohama BayStars. The Carp took two of the three games against Yomiuri to earn their first series win at Tokyo Dome in four years. “It is important to prove we can beat the Giants, so winning the series is special for us,” Kikuchi said. Kikuchi did his part on Sunday by going 3-for-4 with a pair of doubles and a two-run homer. He also homered in Friday night’s 7-2 win. Kimura also finished with a pair of hits including a solo homer. The 10-run outburst was a far cry from the first time the Carp came up against Seddon on April 9, when the Giants hurler struck out 15 and didn’t allow a run until the top of the ninth. On Sunday, the Carp had a 2-0 lead before sending their third batter to the plate in the top of the first and never looked back. Bullington benefited from the run support, allowing three runs over eight innings to earn the win. Bullington (5-4), yielded five hits, struck out seven and walked two. While the Carp are riding high into the interleague schedule, the Giants are looking for answers after losing for the seventh time in 10 games. Seddon lasted just three innings, allowing five runs on six hits. The Giants were limited to six hits and scored all their runs on Jose Lopez’s solo homer in the seventh, and Seiji Kobayashi’s two-run double in the eighth. Nagoya — The Tokyo Yakult Swallows rallied from behind with a five-run fifth, featuring Wladimir Balentien’s two-run single off Chunichi starter Kenta Asakura (2-2), to beat the Chunichi Dragons 7-4 on Sunday for their sixth win in a row to move into a tie for fourth. Kenichi Matsuoka (1-0) yielded three runs in eight innings to win in his first start of the season. At Koshien Stadium, Mauro Gomez and Takashi Toritani both homered and Hanshin downed the BayStars to take the rubber of the three-game series. Naoto Tsuru (2-0) won in relief and Oh Seung-hwan posted his 10th save. At Kyocera Dome, Yoshio Itoi had a two-run double to key a six-run second inning as PL leader Orix rallied in a rout of Fukuoka Softbank. Brian Wolfe (4-2) was roughed up for six runs in 1⅓ innings for the Hawks, who lost three straight for the first time this season. At Iwate Prefecture Stadium, Hideto Asamura hit two of his team’s three homers and Seibu banged out a season-high 17 hits in a romp of Tohoku Rakuten. Ken Togame (2-2) gave up two runs — one earned — in seven innings for the win. Rakuten lost its fourth straight. At Sapporo Dome, Chiba Lotte rallied from behind in the ninth inning with two runs against Hokkaido Nippon Ham, featuring a game-tying homer from Luis Cruz and Yoshifumi Okada’s go-ahead bunt single. Nippon Ham saw its winning streak snapped at five games.